There's a place on Sawtelle (north of Mississippi) that sells sushi for $2.75. * It's called SushiStop. Evidently, they opened a second location also on Sawtelle just south of Olympic. 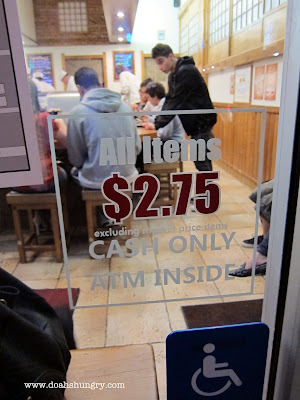 They also sell sushi for $2.75. * Yes, you read that correctly. Two dollars and seventy-five cents. 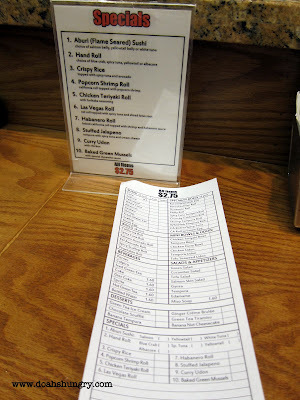 * Special menu items and sashimi plates cost more, but $5-6 at most. Note: Cash only so make sure you make a stop at the ATM before you stand in line for a long time. Like most places on Sawtelle, a wait is expected, but depending on what time you arrive, you may find yourself standing in line for 45 min- 1 hr. because again, like most places on Sawtelle, they don't take reservations. We started with night with a few specials. First, Aburi (roasted) Yellowtail Belly, Salmon Belly, and White Tuna Belly. Next, we shared a sashimi plate, which included all of the major players: salmon, tuna, yellowtail, mackerel, and shredded daikon radish for garnish. The sashimi alright, nothing to write home about. And rightfully so, considering their price. Then again, I've been spoiled with very fresh sushi. Both the eel avocado roll and spicy tuna roll were good. There was nothing fancy about the presentation, but the rolls were set before us quickly. Plus, eight rolls for less than $3 is a steal. I really like crispy rice. SushiStop's was disappointing, but maybe I went in with too high expectations. Sadly, the hand rolls were on the disappointing side as well. SushiStop isn't West LA's premiere sushi place, however, it's worth checking out. The food and service are very similar to Hara Sushi -- decent, and home to great bargains.